The Governor of Edo State, Mr. Godwin Obaseki has made a strong case for the enhancement of judicial workers’ capacity in the National Policy on Justice 2017, which is currently being reviewed. According to Obaseki, this will address the capacity challenge faced by operators in the judicial system with consequent impact on the rights of Nigerian citizens, and law and order. 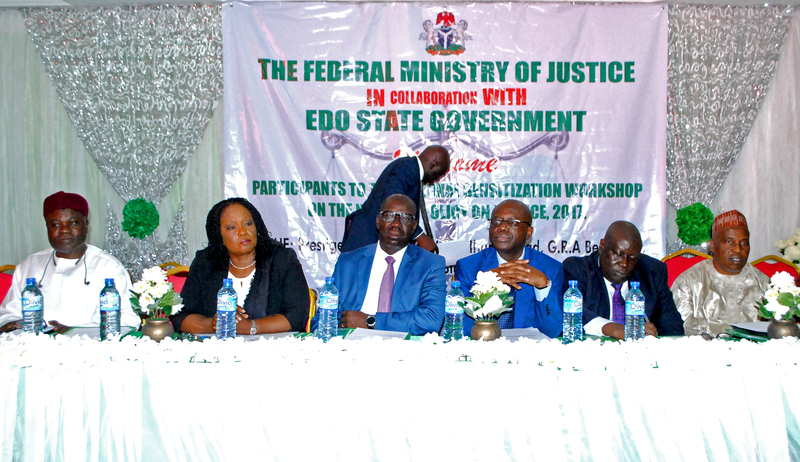 Obaseki made the case while declaring open a two-day National Sensitisation Workshop on the National Policy on Justice in Benin City, on Monday. The governor said that the implementation of a National Policy on justice is apt as the Nigerian Justice system needs to be reformed. “Our administrative justice system craves for reforms. There is need to restore absolute confidence in our justice sector. There are still doubts about the Nigerian judiciary system being the hope of the common man, we are hoping that all the identified challenges in the judicial system would be addressed in the policy, to make for efficient justice delivery in the country. Obaseki noted that his administration has already embarked on the implementation of the action plan to improve justice delivery system in the state. He said the state government has cued into the initiative of the National Security Adviser on prison reform and plans to decongest the prison by 50 percent in March next year. He said that part of the reform includes the appointment of more judges to facilitate speedy trial, invest in technologies to improve record keeping in the courts and the construction of an ultra-modern court complex equipped with digital recording system. Earlier in his address, the Attorney General of the Federation and Minister of Justice, Abubakar Malami represented by the Solicitor General of the Federation, Dayo Akpata, said the National Policy on Justice was necessitated by the absence of a policy framework to foster collaboration among stakeholders in the system. He said it is also in line with effort of the federal government to strengthen the justice delivery system to make it potent for the fight against corruption and protection of human right. He added that the policy will be examined and reviewed through various inputs from participants.